Some stories are difficult to tell. Witness Arthur Miller’s dramas “All My Sons” and “Death of a Salesman.” When the story is true, it’s even harder to relate the details in a way that doesn’t turn the viewer off. Fortunately for theatre lovers, Denizen Theatre in New Paltz, has found not only a play that’s stimulating and well told, but also an actress and a director who are able to translate that play into an energizing and exciting piece of theatre. The Denizen audience has the good fortune to witness a truly remarkable performance by Terri Weagant. Listed not as a performer, but as a Narrator, Weagant embodies the wild energies of a young girl, running all over the theatre, crawling on the floor and almost bouncing off the walls. She tells her story with depth, courage, warmth and purpose. Weagant’s performance is vibrant and lively, and she immediately makes the audience comfortable even while dealing with the difficult topic of depression. It’s an interactive play, which sees the Narrator call out numbers that have been given to each audience member before the show starts, each number representing one “brilliant” thing. Additionally, certain audience members assist by playing the Narrator’s father, school counselor, a college lecturer, a veterinarian and a date / fiancee / husband. The play is performed “in the round,” allowing Weagant to easily engage with everyone in the audience, and it runs 70 minutes with no intermission to interrupt the often acute and powerful emotions and intensity. Denizen Theatre’s choice of a director for “Every Brilliant Thing” is as brilliant as the play itself. Eva Tenuto is the co-founder and executive director of the TMI Project, a non-profit dedicated to using true storytelling for social justice movement building. Allowing people who have difficulties telling their stories or parts thereof to become comfortable with relating those and then performing them as solo events. Who better to direct a play about such a difficult subject as suicide and depression? Tenuto’s skill shines through in every facet of this production. If you’re fortunate enough to see “Every Brilliant Thing” on a Wednesday, do stay for the “Talk Back” with Weagant, Tenuto and Denizen’s Co-Artistic Director Brittany Proia or perhaps Co-Artistic Director Ben Williamson or Founder / Producing Artistic Director Harry Lipstein. On a recent Wednesday evening nearly every member of the audience took part in the “Talk Back” – that’s how thoroughly engaging this show is. It’s not something you will easily forget. Market, 10 Main Street in New Paltz. Showtimes are Wednesday – Saturday at 8 p.m. and Sunday 2 p.m. Tickets are $5 for students, $15 if you’re under 30, $24 for senior citizens and $28 for regular tickets. Call the box office at 845-303-4136 or visit DenizenTheatre.com. MONTICELLO, NY – Governor Cuomo came to the Rutherford Elementary School in Monticello on Thursday, November 16, where an overflow crowd was assembled to greet him. Over 200 students were in the audience, alongside Sullivan County Legislators, county, town, village and school officials. Cuomo was there to announce an expansion of after-school programs in the Mid-Hudson Valley, part of a statewide push to give students productive things to do after 3:00 p.m.
Cuomo then announced funding for services and programs that go on after 3:00 “so you can get more help, more assistance, more growth. And we’re spending $35 million all across the state and we asked schools to come up with the best ideas and we are funding the best ideas. And here are the results in the mid-Hudson district. “Monticello Central School District, which is where we are, is receiving funding for 885 more slots. … Fallsburg Central School District, 400 new slots.” Mentioning Poughkeepsie and Ramapo, among others, Cuomo said that there will be 4,800 new slots in the mid-Hudson Valley. The Governor talked about New York’s free college tuition plan, and then asked the assembled students why they thought the state was “investing all this time all this money all this energy. The first reason is because it’s smart. Because when you get smart you get talented it helps all of us because it helps businesses want to come here because we have the best educated work force.” He asked the students for the second reason and gave the hint that the answer was a four-letter word, offering a very special state gold coin to the student who had the correct answer. Cuomo left the stage then to rousing applause. ROSCOE, NY (November 8, 2015) – Thunder 102 and China City of America have announced that ThunderBlast will celebrate Somerville’s 20th anniversary Friday, November 20th at the Rockland House in Roscoe with performances by Somerville and Iron Cowboy, whose last two CDs featured songs written by Somerville. The event begins with a private Meet & Greet at the Roscoe Beer Company at 6:00 p.m. Thunder 102 listeners have a chance win passes over the next few weeks. “We are so proud that ThunderBlast is back and we are so proud that we can celebrate the 20th anniversary of Somerville with Iron Cowboy. We’re looking for this to be a great kick off to the M & M Auto Group Mission to benefit Toys for Tots,” said Paul Ciliberto, General Manager and Market Manager of Thunder 102. Thunder 102 serves the Sullivan County Catskills and can be heard in Sullivan County and parts of Orange, Ulster and Delaware County, NY plus Wayne and Pike County, PA on 102.1 FM. Thunder 102 is also available worldwide on the FREE RadioBOLD app. Thunder 102, a Bold Gold Media Group station, is a Music Row reporting station and is celebrating ten years of Community service in 2015. NEW YORK STATE (November 4, 2015) – Governor Andrew M. Cuomo has announced the results of Child Passenger Safety Week seat check events, during which 88 percent of the 931 seats inspected were found to be improperly installed. Technicians found that only 112 had been installed correctly, which demonstrates the importance of learning how to properly install car seats and taking advantage of the state- and local-sponsored safety check events. Governor Cuomo announced a number of these September seat checks, which helped parents and caregivers find age- and size- appropriate car seats for their children. Child safety seat checks are coordinated by the New York State Governor’s Traffic Safety Committee in cooperation with state and local law enforcement and community safety partners year round, either by appointment or at events conducted throughout the year. Future scheduled events can be found on the Governor’s Traffic Safety Committee website. A 2012 National Highway Traffic Safety Administration (NHTSA) survey revealed that 20 percent of all drivers of child passengers did not read any instructions on how to properly install their child restraints, yet 90 percent felt “confident” or “very confident” that their car seats and booster seats were installed correctly. Children in improperly installed car seats run greater risks of injury during crashes. According to NHTSA, car crashes are a leading cause of death for children under 13 years old in the United States, and many times, deaths and injuries can be prevented by proper use of car seats, booster seats, and seat belts. Child Passenger Safety Week, which aims to raise awareness of the importance of the proper use and installation of child safety seats, culminated in National Seat Check Saturday on September 19, a day in which free child seat inspections were conducted statewide and across the nation. · Right Seat: Check the label on the car seat to make sure it’s appropriate for a child’s age, weight, and height. · Right Place: Keep all children in the back seat until they are 13 years old. Doing this, along with correctly using the appropriate child restraints, greatly reduces the risk of injury. · Right Direction: Keep the child in a rear-facing car seat for as long as possible. When he or she outgrows the seat, move the child to a forward-facing car seat, and attach the top tether after tightening and locking the seat belt or lower anchors. · Inch Test: Once the car seat is installed, shake it at the base. A properly installed seat will not move more than an inch. · Pinch Test: Make sure the harness is tightly buckled and coming from the correct slots (check the manual). Now, with the chest clip placed at armpit level, pinch the strap at the child’s shoulder. If unable to pinch any excess webbing, the seat is installed properly. New York State’s first child passenger restraint law went into effect in 1982 and has since been strengthened. According to the current law, all children must be restrained in an appropriate child restraint system that meets their size and weight recommended by the manufacturer until they reach their eighth birthday while riding in a motor vehicle. It also notes that a vehicle’s safety belts are not defined as a child restraint system under the law, as safety belts are not designed for children under four feet, nine inches tall, and therefore do not protect young children. In 2014, 375 child safety seat check events were conducted across the state. At these events, 6,223 seats were inspected and 87 percent of the seats inspected were found to have been installed incorrectly, which can include a range of issues: for example, the seat could be expired or not height-and-weight appropriate. It could also mean that children were not using booster seats, which can help seat belts fit properly. Car seat rankings are available here. For more information on vehicle restraints, car seat recommendations for children, and child passenger safety, visit the Governor’s Traffic Safety Committee website. Hours: Mon-Fri, 9AM-5PM. By appointment ONLY. Hours: Mon-Fri, 9AM-3PM. Appointment REQUIRED. Hours: Please call or email cfulton@marlboroughpoliceny.us for appointment. Spanish-speaking techs available. Hours: Tues-Sat, 9AM-5PM. Appointment REQUIRED. Hours: 8AM-8PM daily; by appointment ONLY. Hours: 4th Wednesday of each month; 9AM-3PM. Appointment REQUIRED. NEW YORK STATE (November 3, 2015) – Governor Andrew M. Cuomo has announced the beginning of a new, statewide cooperative effort to crack down on illegal credit/debit card skimmers at gas pumps across New York, seeking to end criminals’ ability to empty the bank accounts of their victims. With card data theft incidents on the rise across the country, the State Department of Agriculture and Markets’ Weights and Measures Bureau is conducting New York’s first-ever training and sweep of gas station dispensers across the state to proactively protect consumers and gas station owners. Agriculture and Markets staffers will train county weights and measures officials to spot skimming devices in their communities. Skimmers are devices attached to ATMs or credit card processing devices to steal the credit card and PIN numbers of customers. ATMs and open point-of-sale terminals, such as gas pumps, are targets for criminals, ranging from local thieves to international crime syndicates. The credit scoring company FICO estimates about 30 percent of all credit card fraud happens at point-of-sale locations such as gas pumps. Government and private research sources indicate that the cost to consumers of point-of-sale card fraud is between $3 billion and $6 billion a year. This spring, a mass inspection of more than 7,500 gas stations in Florida found 103 credit card skimmers in use. The Weights and Measures Bureau developed a training module, which it used to educate its own supervisors and inspectors along with county-level weights and measures staff in how to identify the skimming devices. Those inspectors spot-checked approximately 500 gas dispensers in the last several weeks across the state. A local weights and measures inspector spotted a skimmer in a gas dispenser in Niagara Falls, while an Agriculture and Markets weights and measures specialist found one in a dispenser in Rochester. A subsequent investigation by the Monroe County Sheriff’s Department and the Rochester Police Department turned up four more skimmers at gas stations in Rochester, Scottsville, Wheatland, and Fairport. There are approximately 42,000 gas dispensers in New York State. “Preventing gas pump fraud is not part of the mandate for our Weights and Measures Bureau, but our department’s leaders felt they had the expertise to help protect New Yorkers from this growing scam. I believe we will be able to work together with county bureaus to help prevent and deter some of this fraudulent activity,” said State Agriculture Commissioner Richard A. Ball. · Bluetooth enabled skimmers that transmit stolen information over short distances. If a device is identified, Weights and Measures staff members will alert the gas station owner and local police. “These credit card skimmers cause immense problems for people. This is a natural addition to our skill set and we are looking forward to working together with the counties to help pull the plug on criminals who take advantage of innocent people,” said Mike Sikula, Director of the Weights and Measures Bureau, who helped develop the training program. · A tiny camera attached to the top or sides of the device, sometimes with temporary lighting, to capture credit card numbers and PIN entries on video. 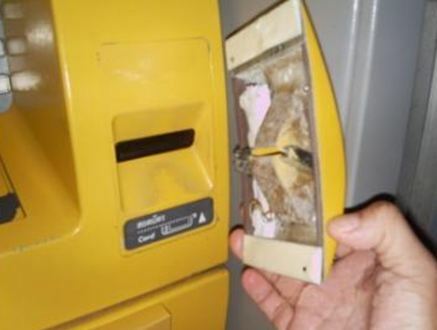 · When inputting a PIN number, cover the keypad with your free hand. If a consumer suspects a device on a gas pump, they should report it to the police. Consumers should check their bank accounts regularly for signs of fraud and report compromises immediately to police and their credit card provider. The Department of Agriculture and Markets Bureau of Weights and Measures works to assure measurement accuracy for a fair and equitable commercial marketplace. State and local weights and measures officials annually inspect thousands of scales, gas pumps, and other types of devices as well as thousands of different packaged commodities. The weights and measures programs are a critical part of New York State’s infrastructure, protecting every consumer and every business. In addition to the State Bureau of Weights and Measures, which has jurisdiction over the entire State, there are 64 county and city weights and measures departments or offices providing services to their communities. SULLIVAN COUNTY, NY (November 2, 2015) – Tuesday, November 3 is Election Day. Polling places throughout Sullivan County will be open from 6:00 a.m. to 9:00 p.m. In Sullivan County there is a State Supreme Court Judge race, as well as county-wide races for clerk, treasurer and coroner, and races in all nine legislative districts. There are also towns races and a race in the Village of Woodridge. There are ballot propositions in the Towns of Fallsburg, Mamakating and Neversink. Propositions are located on the back of your ballot. Be sure to turn your ballot over after selecting your candidates. For additional information, call the Sullivan County Board of Elections at 845-807-0400. The Sullivan County Board of Elections is located at the Sullivan County Government Center in Monticello.